You would imagine that being a yoga instructor would be one of the most carefree, stress free jobs in the entire world, wouldn’t you? Surrounded by lots of fit bodies, focusing on your own body, and finding some serious Zen. Well, although it’s true that if yoga is your calling, then getting paid to practice it is a joy, but it’s not always the perfect workplace you might think it is. There are frequently external distractions, as well as distractors, during class time. Everything from students who don’t seem to believe in deodorant to those who are looking at their phone they have between their legs during child pose. Take a look at what some instructors say are their top pet peeves when it comes to their yoga class. Hopefully this list will be helpful to instructors everywhere. Unfortunately, some people aren’t content to let their instructor lead the class, they have a particular pose in mind and they want to get to it! “Let’s do a crow pose” or “I want to do a headstand” are classic examples of pose chasers. Many poses are not something you just “get”. Poses go together, like macaroni and cheese. For example, you will learn how to push down low by doing the downward dog. This will eventually prepare you to take the crow pose. You need to learn to build your core strength and gain balance in standing poses that will then help you to do headstand. Don’t think of yoga as a series of stand-alone poses, but a sequence of poses that work together to get you to those more advance poses so stop being a pose chaser and asking to do certain poses. Too many people come to yoga class to show off and impress other class members. You aren’t going to get much out of class if you are constantly forcing yourself into poses. And if you find yourself struggling with poses, then you are most likely doing them incorrectly. Yoga class is not about impressing anyone; it’s about moving yourself into poses fluidly and listening to your body. Use props when you need them! Props are there to help you get into the correct alignment and be comfortable no matter if this is your first class or your 50th class. Using blocks or other types of props doesn’t make you less of a yogi, but trying to outdo your neighbor surely does. Although you might be totally impressed with your yoga teacher, they’re people just like you, so don’t be afraid to ask questions or give them feedback. Some instructors say that they go through entire classes where no one says one word and it gives them an eerie feeling. Ask questions if you have them and give your instructor feedback, even if it’s negative. Instructors need love and feedback too! Some people feel that they absolutely must struggle to achieve a pose. So they force themselves into certain poses, no matter how difficult it might be. Practicing yoga with force only puts more stress on the body and the mind and it sure doesn’t feel good. Yoga is supposed to feel good, remember? People should keep that in mind and think about moving with ease so that they can accomplish more with less effort. You will feel better about class and yourself if you remember that yoga is about fluid movements, not twisting yourself like a pretzel no matter how much it hurts. Many people come to class and compare themselves with others. They see someone in class who might be older, maybe a bit overweight, and they think they should be able to do more difficult poses than this person. So they struggle with poses that they aren’t ready for. Students should remember that most classes have people of all levels. That older, overweight person might have been practicing for 15 years or more or they could simply have more flexibility than you. You need to recognize this and get over it. Stop looking at what everyone else can do and focus on yourself. This way, your practice will grow slowly and steadily, as it should. Nearly everyone in yoga class is there because they want to turn their focus inward and pay attention to their bodies. 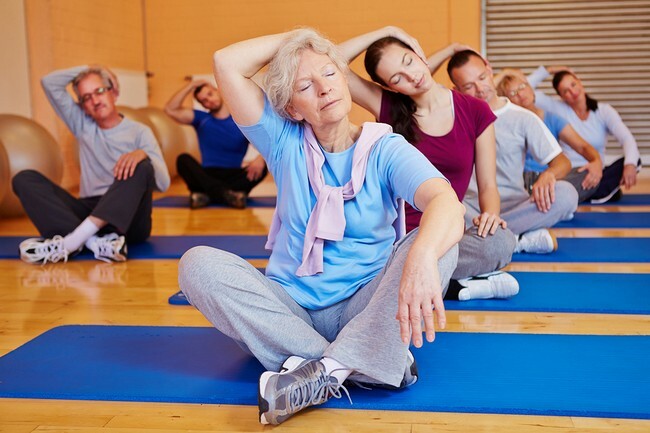 Most people in yoga class want to live a healthy, more natural lifestyle. However, there are some people who are, well, a little too natural. When you come to yoga class, please shower and wear some type of deodorant first. All that sweating in close quarters gets a little dicey when some people neglect their personal hygiene. For the sake of your teacher as well as your classmates, don’t confuse being natural with being stinky. The opposite of closed mouth people are the ones who are constantly talking. You know, the classmates who are constantly piping up with those little comments “Oh, this feels so good”, or “I can’t do that, how are you doing that?” Or worse, the neighbor who is whispering to her friend/daughter/sister-in-law/ about some personal matter. Talking is ok when it’s appropriate, but endless chatter is not. Show respect for others around you and keep the chit chat to a minimum. When your instructor comes into the room, please be ready. Those who come walking into the classroom, talking on their phone, setting down their mat and their water, etc, etc, interrupt the entire class. It is super irritating to everyone, especially your instructor. Please be on time and ready to start when your instructor arrives! The opposite side of the coin of the late comers is the early leavers. Of course, no one plans for an emergency and those things do happen, but when you see the same people habitually leave class during the relaxation part of the class, or the alarm on their phone goes off 15 minutes before every class ends, this is just as annoying as those who come late. Everyone will understand the occasional emergency but if your schedule does not allow you to stay for the entire class then choose a different class time and show some respect for your teacher and your fellow students. Yes, we mean you students who, for whatever reason, don’t think you need to wear underwear. YOU DO! Especially you, gentleman. Don’t wait until someone (usually your embarrassed instructor) has to ask you to do it, please be kind to everyone and wear appropriate undergarments. Yoga is about freeing your mind, not exposing your private parts.